Swipe the Twix wrappers off the couch, you're gonna need the extra seat. 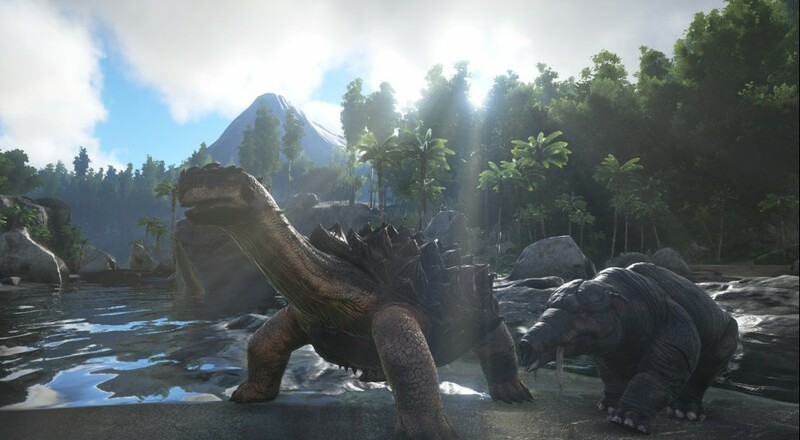 Studio Wildcard has confirmed its open world game ARK: Survival Evolved will get a local splitscreen mode on the Xbox One. And they said splitscreen was on its way out. Pshaw! The world of ARK mixes prehistoric weaponry with far-future technology that baffles the likes of our modern minds, creating a unique atmosphere that's filled with surprises and OH MY GOD IT'S A DINOSAUR. Players awake on the beach of a mysterious island surrounded by other confused humans. Everyone has to figure out how to stay alive, which includes hunting, harvesting, crafting, researching, taming the local inhabitants, and building shelters against the elements. The couch co-op splitscreen feature will be an Xbox One exclusive for the time being, but it should be ready in early 2016, far ahead of the game's official release. Clever players can start playing ARK right away by checking out Steam's Early Access or Microsoft's fledgling Xbox Game Preview program. Keep in mind it's alpha and all that, so don't expect the full dinosaur experience just yet. Page created in 0.5127 seconds.